Easter is a perfect time to get everyone together for some quality family time. Mix in some creative crafts and fun D.I.Y. to keep the kids busy and you've got yourself a winner. Nothing says Easter better than decorating eggs with the kids. This egg-cellent project will not only be a fun activity for the family but will also look great as Easter decorations around the home. To complete this project, you'll need a paintbrush, scissors, hard-boiled eggs that have been cooled, some paint sample pots and coloured ribbons. To start, paint each egg in a solid colour and allow to dry. Once dry, paint on patterns and allow to dry. Then, cut ribbon to desired lengths, and loop around eggs as shown, securing at the top and allowing enough ribbon to suspend eggs from your chosen branch. Get outside in the garden! As the weather cools down, now is a good time of year to get wrapped up and out into the garden. Get the kids involved in planting some winter veggies and plants that will be ready to harvest when spring comes around. If you're in a smaller space, a vertical garden is a simple way to bring greenery to a balcony or courtyard. Check out Garden Diaries to get inspiration on what to plant. You could even have a go at building a child-friendly edible garden with these handy tips. 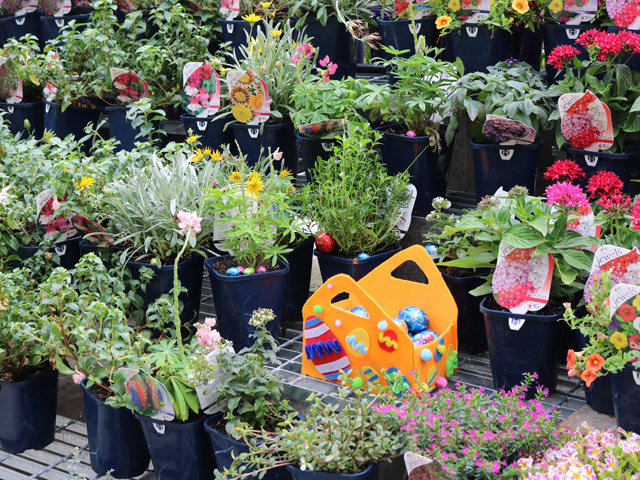 Bunnings is hosting its annual free Easter Family Night. Head to your local Bunnings store with the kids this Thursday 11th April from 6pm-8pm (Wednesday 10th if you're in WA) to enjoy a fun night of D.I.Y. craft activities, entertainment, refreshments, face painting, Easter egg hunts and of course a visit from the Easter Bunny. It's easy to register your attendance by visiting your store page on the Bunnings website. With a long weekend ahead of you, it's a perfect time to refresh the home with a fresh lick of paint where it's needed most. From upcycling a piece of furniture to painting a fence that needs some TLC, a block of 4 days off in a row is handy for getting painting projects out of the way. Kids also love to have a go of painting themselves, so give them a small painting area to look after and let them be creative. They'll be super proud of themselves once their area is full of colour. If your kids are planning on going on an Easter hunt, then this basket is a must. It's easy to make and they can decorate it in their favourite colours. You can download a template and follow a simple step by step how-to guide over on the Bunnings website. Decorative items can be anything fun and colourful, which are easy to apply with a spot of glue.